When you own an ATV, there is probably nothing worse than taking a step outside and seeing that it is no longer parked where you left it or that it has been severely damaged by someone who messed around with it while you were away. Your ATV is something that you took a time to shop for, made sure it was just the right size for you or your kids and probably spent time shopping around until you found just the right price. It does not matter if the ATV is parked at your home, in a garage or even outside of your campsite in the middle of the woods, keeping it safe and secure is something that all ATV owners must be vigilant about as theft can happen at any time and at any place, day or night. We have put together a list with a few of the most important things you can do to keep your ATV safe and secure no matter where it is parked. You may be limited on space or have nowhere to store your ATV other than outside of your home, but it is important that you do what you can to keep it out of sight from potential thieves. Buy a cover and be sure to use it when the ATV is parked outdoors. If you are hauling it to or from the woods, try to unload it quickly when you get home and never leave it sitting on the trailer for long periods of time. If you do need to leave it on the trailer when you get home, place it in a spot that criminals are not able to access it without being noticed by you or those in your neighborhood. People often assume that if they place their ATV in a garage or a storage unit that is will be completely safe. Unfortunately, people can break into buildings and will take anything they can get their hands on. 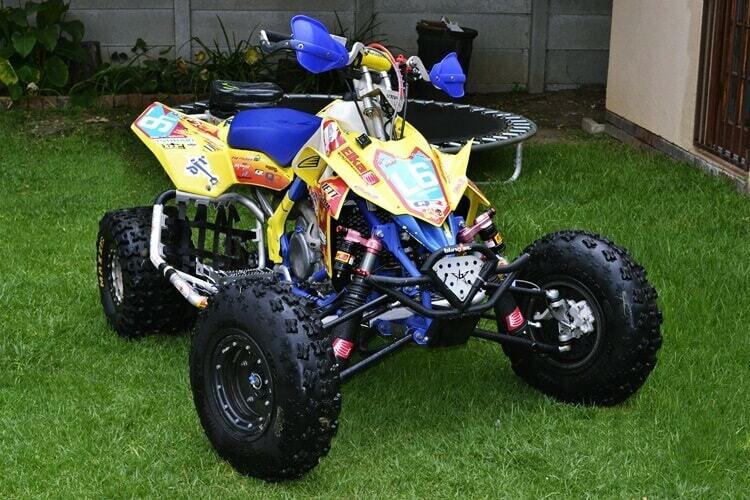 If your ATV is placed indoors, make sure that you purchase a good lock and keep it locked up always. This means to keep the garage or storage unit doors and windows locked as well as placing a lock on the ATV itself. If possible, contacting a good security company and having an alarm installed is a great idea as well. Security companies can also assist with alarms that will fit right on the ATV which can be used to track it down if it is stolen or lock the engine or wheels and make it very difficult for someone to steal at all. Alarms and locks are a great way to deter criminals and keep your ATV safe and secure. Something of great importance is to make sure you never store the key to the ATV or the security lock in the same location it is parked. Insurance may be one of the most important things that you can purchase to ensure security for your ATV. You need to purchase a policy for the ATV alone. This is especially a good idea if you have the ATV financed and want to make sure nothing happens to it. Due to the nature of how people ride ATV’s and where they are most often used, insurance coverage will not cover damages but it will cover theft or vandalism and should pay to replace the ATV if it is stolen. If you are traveling and your ATV is on a trailer, be sure to park where a security camera will be focused on the area that the trailer will be parked. This is important when stopping overnight at a hotel that may have security cameras in the parking lot and will help prevent theft while you are on the road. You should also take detailed pictures of the ATV and keep them filed away just in case anything should happen and you need detailed pictures for law enforcement. Theft happens and ATV’s are stolen daily, but being vigilant with your security resources can greatly reduce the risk of your ATV being stolen or damaged by vandals who may have access to it.